Ronnie won for the third time in the Crucible - Joakim A. 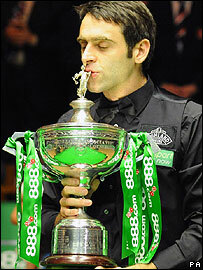 Not that surprising Ronnie won quite easily over Ali Carter in the final. Ali looked tired and worn out from his hard semi-final against Joe Perry and failed to make use of O’Sullivan’s mistakes. Ronnie on the other hand wasn’t too happy with this game in the final, which wasn’t up to the same standard as when he easily beat Stephen Hendry in the semi-final. After the match Ronnie again said that he might take a break from snooker. He always says that after the season but so far he’s always been back in the autumn, so we’ll see.